At dawn, a runner stops to stretch and take in the sunrise view of the Lake Mendota from a newly constructed, stone gathering circle and fire pit at the tip of Picnic Point. In addition to the installation of broad stone steps that now lead visitors to the shoreline, staff and volunteers also cleared the tree-lined area of invasive buckthorn shrub. Picnic Point is part of UW–Madison’s Lakeshore Nature Preserve. It’s always been a favorite spot on the University of Wisconsin–Madison campus, but Picnic Point had been showing its wear. Invasive trees and shrubs have blocked views and turned paths into tunnels worthy of a gothic horror tale. Tourists have trampled, and students have stumbled. The results were evident, especially at the tip of the point, surrounded on three-and-a-half sides by Lake Mendota. Now, through the generosity of the Ebling Picnic Point fund, this sacred area is on the rebound. 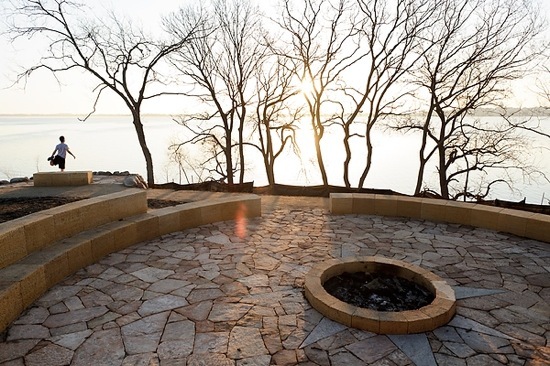 The improvements start at the point itself, where landscape architects and contractors have just finished building a stone gathering circle around a firepit. Nearby, a set of winding stone steps give access to a small platform just above the lake. For the first time, visitors at the point can safely walk down to the water, without eroding the fragile banks, says project manager Rhonda James, a landscape architect with Facilities Planning and Management. At the tip of the point, and throughout the preserve, FP&M staff, members of the Friends of the Lakeshore Nature Preserve, and a host of volunteers, are removing buckthorn, a dense, invasive shrub that blocks views, shades the ground, and dominates other plants. The UW–Madison campus is a natural place to honor and repair nature, Barker says. “Think about how the people who came from this campus shaped our view of the environment. John Muir, founder of the Sierra Club, was the first to say that nature is beautiful and worth saving for its own sake, a radical idea for the mid-nineteenth century. And then Aldo Leopold, our first professor of wildlife ecology, wrote about the ‘land ethic,’ and our obligation to care for the land and its living inhabitants,” he says.